Variable speed 5,000 - 35,000 rpm. On/off switch with collet lock out function. Soft grip body for comfort and ease of use. Supplied with 65 Dremel accessories. 225 - 678- 576-577 Attachments flex shaft, line and circle cutter, shaping platform and a detailers grip. 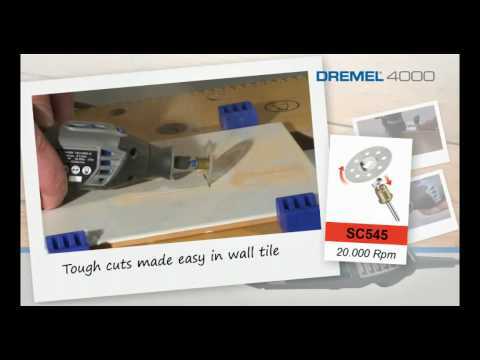 The Dremel 4000 mulit tool kit is great for craftsmen with a demanding work schedule. It is a very versitile multi tool which is supplied with a selection of different accessories so that it can be used for sanding, cutting, sharpening and much more. It has a powerful 175w motor and is supplied with 65 accessories, a high quality flex shaft, pencil grip nose cap, line and circle cutter, shaping platform and a detailers grip.